Perhaps a more realistic expectation would be to wait until Tuesday night’s contest against Tampa Bay. By then Rolston will have had two full days of practice in addition to today to install some of the systematic tweaks he will want to run. Hopefully by Wednesday he has a firm grasp on running the team. For all intents and purposes last night was a lost game. Despite another dazzling effort in goal by Ryan Miller, the Sabres were unable to score, found ways to turn the puck over regularly and were poor on special teams. The landscape would have been drastically different had Thomas Vanek cashed in either of his glorious opportunities in the first. The same goes for Cody Hodgson’s missed empty net. The disallowed goal on Kevin Porter’s goalie interference play was the final straw in what could have been a 4-1 lead. The second period letdown deflated the team and their lack of puck possession carried over to the third period – in which they did outshoot the Leafs – and kept them from mounting any sort of comeback effort. 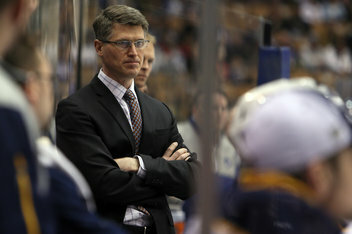 If there is only one aspect that Rolston needs to revamp it is the special teams play. The penalty kill has been very average and yielded a pair of goals yet again while the power play is befitting of a Benny Hill Theme video. The Amerks have one of the AHL’s best power plays and I’m anticipating seeing some of Rolston’s theories put to work immediately. The first order of business should be fixing the atrocious zone entries the Sabres currently attempt. There is utterly no flow through the neutral zone and past the attacking blue line. More often than not there are four stationary players waiting to enter the zone while the puck carrier corners themselves high along the sidewall. If all goes according to plan the puck carrier plays a cross-ice pass to a point man and continues to his assigned spot. However, the entry is so easy to defend that the penalty killing forwards need only to play firm on the blue line and push high in zone to eliminate options and cause a bad pass that leads to a clearing attempt. This needs to change and it needs to change immediately. I don’t have an answer to what would work better. But there are plenty of options. Perhaps keeping more than one player in motion through the neutral zone would be a good start. I do feel confident that with additional zone time (thanks to an improved entry) these units will begin to produce. The cycle and plays the team runs once in zone are strong enough to endure, but maintaining possession has been the true bugaboo. Tomorrow ought to reveal a few systematic changes that will hopefully open the floodgates come Tuesday night. The penalty kill has been just as bad as the power play lately. The Sabres run a perplexing rotation at the top of their box that seems to morph between a traditional box and a triangle-plus-one. Basically the puck side forward will follow the puck across the zone as the second forward stays staggered yet stationary. The problem is that the stationary forward serves almost no purpose to the kill and having his partner chase across the zone is opening up glorious scoring opportunities. Claude Giroux’s goal in the opener and Dion Phaneuf’s tally last night are perfect examples. The second forward needs to maintain the lane across the ice when his partner pushes out on the puck carrier, Buffalo’s current rotation doesn’t allow for this and it is costing them chances and goals. Another point on the penalty kill, the flawed rotation is causing more stress on the defensemen who are scrambling to clean up rebound off open looks. It is limiting time and space for clearing the zone and that is piling on the already obvious shortcomings the unit is having. Kevin Porter’s debut wasn’t too bad. His goaltender interference call was questionable but necessary. Yes, Scrivens was pushing to that area and well out of his paint. Yes, Porter was pushed into the goaltender. However, that is a call the Sabres have benefitted from already this season and it was one the referee needed to call. No matter how weak it was, that was the call that needed to be made. Defensively the Sabres still need some help. TJ Brennan looked very average last night and should be replaced by Jordan Leopold (if healthy). Mike Weber remains consistent as does Robyn Regehr and Christian Ehrhoff. I thought Alex Sulzer had a rough night and was particularly bad on the two-on-one that led to JVR’s first goal. Tyler Myers was only okay once again. He hasn’t been as bad as he was pre-scratch, but he still isn’t where the Sabres need him to be. I’d entertain finding a spot for Brayden McNabb and Adam Pardy at this point. A little more sandpaper couldn’t hurt this unit. Porter proved to be far more dynamic that Jochen Hecht has been to this point. Hecht has appeared to be tentative and unwilling to engage in many situations. Porter was hungrier and brought plenty to the table. I can see him sticking for a while. Why is John Scott still active? Not only is Cody McCormick a far more capable player, Scott’s three minutes a night aren’t providing a benefit to the team. Even if he wins every fight he cannot be justified. I thought he was an okay signing over the summer but there is no place for him on what is becoming an obviously flawed roster. At least Ryan Miller is continuing to prove that he isn’t the problem. I counted four goals that he took away from the Leafs on golden chances. Even if you argue that he should/could have stopped one of those goals last night, it doesn’t matter much when your team is only scoring one goal per game.